It's been a big year for Jim Henson's Muppets. 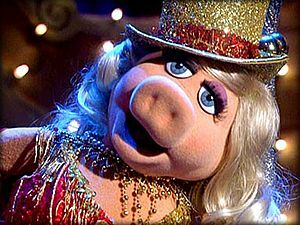 Two thousand two marked the 25th anniversary of the groundbreaking The Muppet Show, and saw the debut of a line of action figures from Palisades Toys, not to mention a new series of Mastercard commercials. Now, on Friday, November 29, the popular foam family will be appearing in their first made-for-TV movie on NBC, "It's a Very Merry Muppet Christmas Movie". Joining the renowned characters are human actors Joan Cusack, David Arquette, William H. Macy and Whoopi Goldberg. Muppet veteran Kirk Thatcher directs from a screenplay by Tom Martin (The Simpsons, Just Shoot Me) and Jim Lewis (Muppets Tonight). The movie is executive produced by Brian Henson and Juliet Blake. Spoofing everything from It's a Wonderful Life to Moulin Rouge, "It's a Very Merry Muppet Christmas Movie" gets the characters back to basics as it tells the story of Kermit the Frog struggling on Christmas Eve to save the Muppet Theater from "the stylish, yet Scrooge-ish, bank owner Rachel Bitterman" (Cusack), who wants to destroy the building and build a nightclub in its place. Aided on his holiday mission is an angel, played by Arquette, as well as the rest of the beloved Muppet gang. "All of us would have had much less rich and joyful lives without Jim... We love this chance to think about how lucky we've been." A nine-month production miracle, the movie was shot in Vancouver this past summer -- on digital video, a format that the late, tech-savvy Henson would have loved -- and marks the first time the principal Muppet performers have been together for a feature film since Muppets From Space. The movie had its sole theatrical screening at the Loews Orpheum Theater in New York City this past Monday as a reward for the artists at the NY Muppet Workshop who worked around the clock to create the various costumes, props and special effects needed for the movie. "It feels great," says Dave Goelz (The Great Gonzo). "First of all it [was] great to be in Vancouver doing this. The crew [was] so good, so efficient, so kind and couldn't be better. Getting the characters back for this piece is wonderful too, because it's a very warm piece about the relationship of the characters. It's really essentially the story about Kermit ultimately finding out what kind of an impact he has had on the other characters around him. How bad their lives would have been without him. So for all of us, it's very poignant, because it resonates with our experiences with Jim. All of us would have had much less rich and joyful lives without Jim. We were just fortunate to run into this guy, and for him to see some value in what we could contribute to the work we were doing. It was an enormously enriching thing for all of us, so we all love this piece. We love this chance to think about how lucky we've been." Goelz, who has been with the troupe since before The Muppet Show days, has nothing but good things to say about first-time Muppet director Kirk Thatcher, who had previously worked with the troupe as a writer on Muppet Treasure Island. "He has turned out to be absolutely wonderful," says Goelz. "Directing is always a tricky thing for us. Working with someone who has never worked with us before is always a learning curve. You take a certain risk with chemistry. You want to find somebody you have good chemistry with, who will inspire us and whom we can inspire. Kirk has turned out to be so wonderful. All this time we had this guy in-house who could take on the role of director and not only do nice work but be flexible and have fun with it. He knows the humor, he knows the chemistry, he knows all the characters, he knows how to shoot. He can take advantage of ad-libs while we're shooting, and make decisions on the fly. So I'm looking forward to doing more work with Kirk." And what makes a poor director, in Goelz's opinion, to contrast with Thatcher's success? "Someone who comes in and says 'Relax. 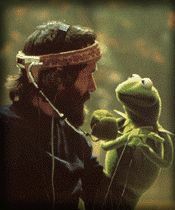 I've worked with puppets before.'" He laughs. "You know you're in trouble. This has happened." "It's A Very Merry Muppet Christmas Movie" airs Friday, November 29, 8-10 p.m. on NBC.